To say that Pompeii is bad is an understatement. Directed by Paul W.S. Anderson, the director of such art house classics as Death Race (remake), Resident Evil and some of its sequels, The Three Musketeers (AAAAAHAHAHAHA), Pompeii has nothing to say about any point in the film and if you are waiting for the destruction by Mt. Vesuvius to be entertaining then this will be as long as you fear it can be. At 96 minutes the credits start running and I was hurriedly looking for the remote to quickly get this film off of my TV. I already know that Anderson is not a good director with only two films that I can say are good. Event Horizon was a terrific, if somewhat flawed gothic haunted house flick that takes place on two spaceships and was genuinely scary as hell. His first film WAS an actual art house film called Shopping starring a then unknown Jude Law and Sadie Frost about thieves who steal cars, smash them into shopping plaza stores and make off with as much as they can carry. Since then it has been all downhill. 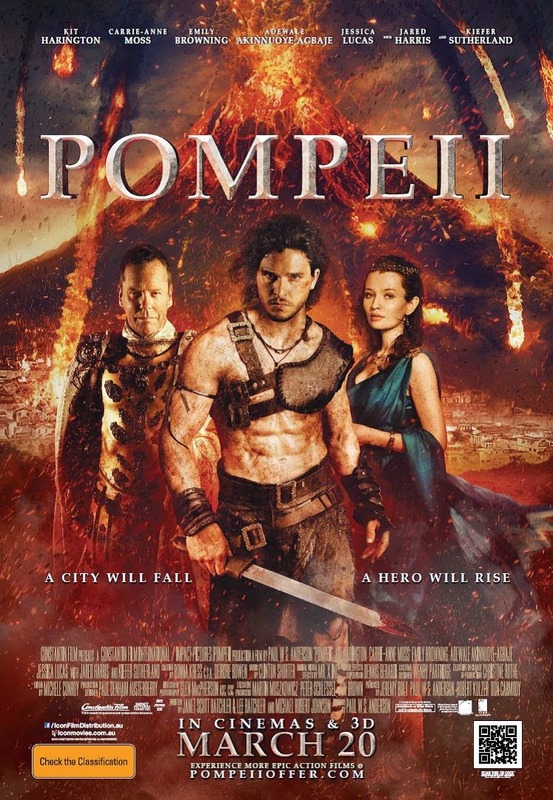 Pompeii has decent cast but I can't see why any of them would want to be in this dreary, mundane, insipid, sappy and routine "swords and sandals epic". And another point, if I were Ridley Scott, the producers and writers of Gladiator, I would look into a law suit for plagiarizing or copyright infringement. Yes, it is that blatant. Kit Harrington is Milo, a slave whois forced into becoming a gladiator in Rome. His family has been slaughtered by Roman troops led by the evil, Corvus (Kiefer Sutherland). Milo's newest friend starts out as his fiercest enemy named Atticus (Adewale Akinnuoye-Agbaje). Atticus carries wooden figurines representing his family, of course anyone who has watched Gladiator knows these are plot gimmicks that have been unabashedly copied from that film. But wait there is more. When Atticus and Milo become brothers from other mothers, they and the other slaves are forced into the Colosseum to reenact a battle that made Corvus the legend he has become. Milo and Atticus turn the tables on the Roman warriors during the reenactment and win the battle. Sound familiar, anyone? Milo, at one point hurls a spear into the balcony at Corvus almost impaling him. Remember that scene from Gladiator? These are just a few of the big problems I had with Pompeii. Aside from stealing entire scenes from a monumentally better film, Pompeii has an absolutely witless script by Janet Scott Batchler, Lee Batchler and Michael Robert Johnson. There is not one scene that felt real or honest and the acting is horrendous. These actors are all good actors as is Emily Browning, Jared Harris, Carrie-Ann Moss and Jessica Lucas. Did they not read the script and see what a turkey this was? The action scenes are wretched. The love scenes are are about as much fun as cleaning a toilet. The lighter moments that are supposed to be humorous are about as funny as watching someone read an operating manual for a calculator. The acting is painful to watch. These are accomplished performers who are simply cashing checks. The script and the inept directing by Anderson give these characters no depth, no charisma and NOTHING to do or say with any originality. Sutherland has an accent that appears and disappears from scene to scene and he is GROSSLY miscast. What were they thinking?